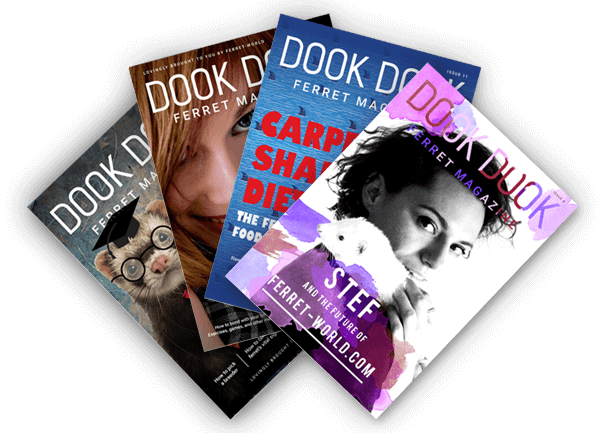 Ferret Information For Aspiring Owners - What Is A Ferret? A ferret is a small, weasel-like animal, resembling the love child of a cat and a tiny bear, with a long, slinky body. Ferrets are highly intelligent and inquisitive animals. They are obligate carnivores, meaning they can only digest meat and meat-based products, as they lack the enzymes needed to digest plant matter properly. Amongst ferret owners, they are most known for their cheeky antics, playful behavior, and lovable nature. Yes! As pets, ferrets are social, sweet-natured, very playful and energetic, and trainable, but easily distracted. They are clever and more determined than most cats and dogs to explore all of their surroundings. Ferrets are a delight to own, but they can be a lot of work! By no means are ferrets low maintenance, that is why we recommend doing plenty of research before buying a ferret. While ferrets are small and they can sleep up to 18 hours a day, they are also easily bored and need lots of stimulation. While they should be kept in a cage (see why and how to select a cage in Ferret Cages), they need at least 4 hours of human-supervised out-of-cage playtime a day. They can be litter trained like cats, but they poop more often than cats and you must change their litter every day. They are self-grooming like cats, but you should clip their nails regularly. They may also need to go to the vet more frequently than other pets because they are more susceptible to serious and non-serious illnesses. 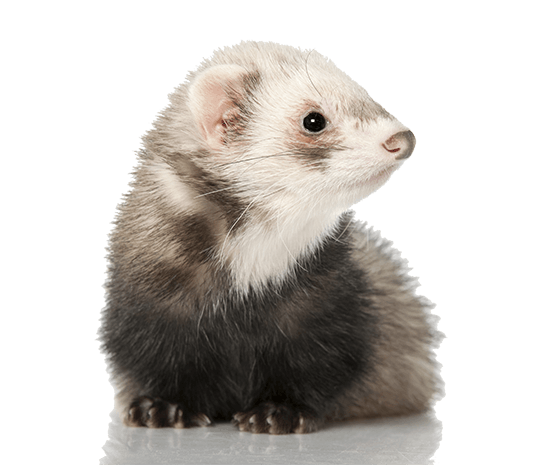 The ferret was domesticated from the European polecat, the Steppe polecat, or both, between 2,500 and 3,500 years ago. (The cat was domesticated around the same time.) Like other domesticated animals, ferrets are bred for docility and sociability. The European polecat is a solitary hunter, like the cat’s ancestors, and the Steppe polecat is a communal hunter, like the dog’s ancestors. This likely mixed ancestry means that individual ferrets may appreciate being kept with mates or all alone. Some ferrets, like cats, will never really get along with other ferrets. Other ferrets will be perfectly content in a large business (a group of ferrets). While many people believe ferrets are rodents, they are actually part of the Mustelidae family, with otters, weasels, polecats, badgers, and minks. Mustelidae is the largest family of carnivores. While they vary considerably in size, mustelids typically have short, stubby legs and long bodies. The smallest mustelid is the least weasel, who can be less than a foot (30.5 centimeters), and the largest mustelid is the giant otter, who can measure up to 5.7 feet (1.7 meters) long. Ferrets are, like other mustelids, highly intelligent and owning a ferret is much more like owning a cat or dog than it is like owning a rat or hamster. 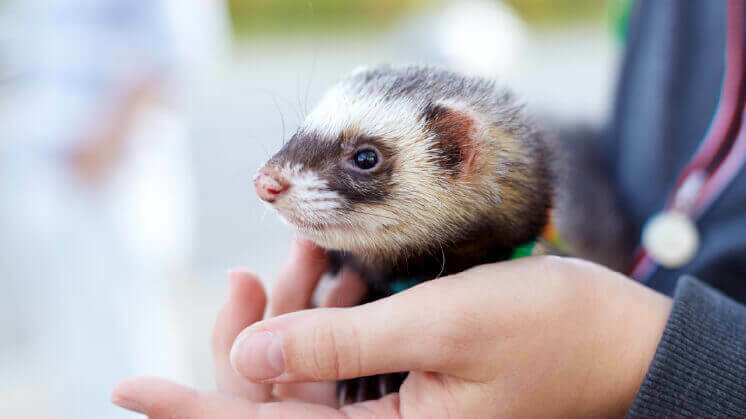 There have been some sensationalized stories of ferrets that have attacked and maimed young children, but most of the ferrets in these cases were abused. 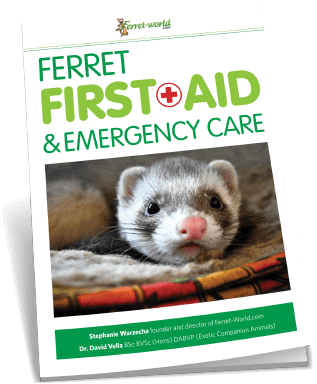 Some ferrets are prone to biting, but this is true for all domesticated companion animals. Dogs bite approximately 4.5 million people a year in the United States alone! While ferrets can bite children, a dog is 200 times more likely to bite someone than a ferret is. Because of their much larger size, dogs and cats are much more likely to cause hospitalization and death from biting than ferrets. Unless we are to consider dogs a public health nuisance, it makes no sense to see ferrets as particularly dangerous. To avoid bite injuries and fatalities, small children and infants should not be left unsupervised with ANY companion animal. Just like with any companion animal it is important to properly train, handle and socialise your pet ferret. Ferrets are quite intelligent and can be trained to do tricks. They can solve puzzles and any ferret owner who’s unsuccessfully tried to ferret-proof their home can tell you how clever they are at getting around obstacles. 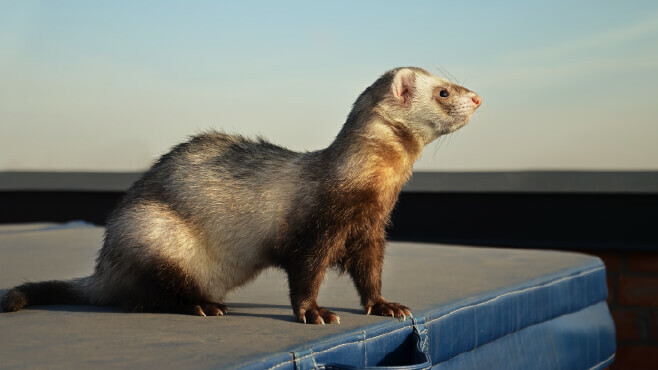 Ferrets rank above cats and dogs in their problem-solving ability, but below cats and above dogs in memory. Ferrets do smell. 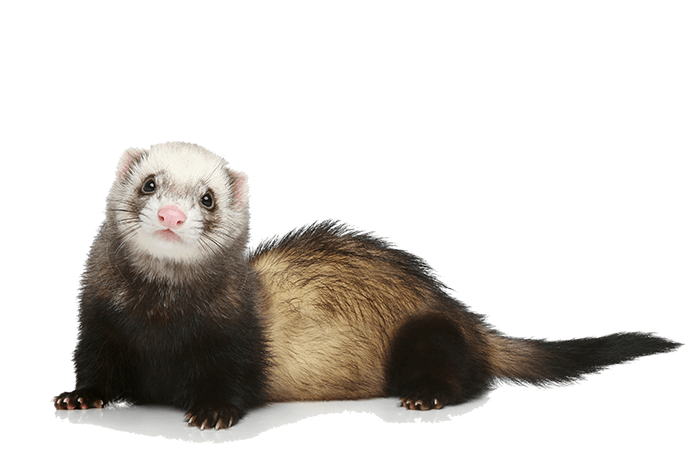 The oils in their skin give ferrets a musky odor that most ferret owners don’t mind, but some folks find unbearable. And since most ferrets are caged, their skin oils build up in their bedding and increase their smell. We don’t recommend judging ferret odors by what you smell in a ferret owner’s house, since that person may not be as good about washing the bedding as you would be. Rather, put a ferret up to your nose and sniff them. Could you get used to that smell? If not, a ferret may not be for you. Like dogs, cats, and other animals, a ferret will change the way your house smells, but you can mitigate the stinkiness by cleaning their bedding weekly and changing their litter boxes daily.